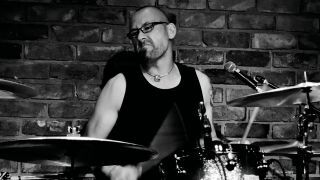 Tim is a professional drummer and drum tutor who has recorded, toured and played with Don Airey, Kee Marcello, Aynsley Lister, Vivid, Persian Risk, The Four Tops, Downtothebone and Nickolodeon and worked with members of Deep Purple, Jamiroquai and The Kinks. He is also the co-founder of Drumbreaks events and performs drum masterclasses and clinics across the UK. Tim was also one of the tutors involved with Rhythm's 100 Greatest Drum Beats. In Rhythm's latest bookazine, available to buy now by the way, Tim shows you how to play tracks including 'Shakin' All Over', 'Honky Tonk Women', 'Wipeout', 'Sing Sing Sing' and the Amen break. In the latest video from his online YouTube series, Tim shows us the basics of double bass drumming.